1. Craig Pietrow distributed FRS radios to those with DSW cards who do not have a radio. 2. If you are in need of CERT-related equipment, including a radio, contact Craig direct (email address removed when posting online). at the time of writing there are 4 seats left for the early session, and 13 for the later one. Please attend all that you can. 4. There are six CERT Academies each year, one in each of the cities in the Santa Clara County Fire Department. Saratoga’s event runs April 30 – May 19. Please encourage friends and neighbors to sign up, particularly those already involved with Neighborhood Watch. 5. The meeting discussed, and Davina later distributed, information on the location of our emergency cache, and other relevant division information including contact information for all active members of the division. 7. Marion Yager volunteered to be deputy logistics supporting William Brooks. Thank you Marion! Our division is in need of a deputy or co-lead to support Davina. 8. Chuck Rader led the group in a focused training session on the first section of the Emergency Operations Plan for Cox Division. He has graciously agreed to lead future sessions covering the remainder of the EOP. Volunteers are needed to help develop Argonaut CERT’s own division EOP. This will be relatively easy as we can build on the work already done by Cox division, editing only the elements that are specific to our division, such as location of cache(s), meeting points, etc. Please contact Davina if you are able to help. Michael Taylor might get a meeting or two between CERT leadership and Crystal to help pass the torch. The CERT AED is now in the trailer and will be looked after by the Saratoga staff. It is actually on the city’s prescription as well. Next, Petersen Base needs a similar Ham radio setup. Jeff mentioned that the trailer needs to move 2 to 4 times a year or should be placed on blocks to not permanently damage the tires. Michael would like it out and present at things like the car show, preparedness fairs, etc. Craig has given out over 20 FRS radios thus far. Need to be active with a DSW card to get a radio. Generators all tested about 3 weeks ago except for one of the larger CYB units. Discussion about starting a ICP cache at Keven Moran park. Discussion about deciding what constitutes an ‘ICP in a box’ and then get it in for budgeting over next year or two. Discussed the need for a Logistics Deputy to give coverage for someone out of town…or…to cover opening two bases concurrently. Discussed who can drive the trailer. In an emergency, with proper direction, a CERT member with proper towing capability can tow the trailer. Ball and hitch is available in the trailer. Shelter Fundamentals was held last month. Thanks to those who attended. ARC will hold a shelter simulation likely on 6/22 (9:00 AM – 1:00 PM) and hopefully 12 to 15 CERT members whom have completed the Shelter Fundamentals classroom training. The American Red Cross Shelter Simulation exercise for Saratoga CERT will be scheduled for Saturday, 22 June 2019 (9:00 a.m. to 1:00 p.m.) with Jim Mollerus, the ARC Silicon Valley Chapter Mass Care Coordinator. The desired number of Saratoga CERT participants is between 12 to 15, all of which have attended the ARC Shelter Fundamentals classroom training. Of this total, it is further requested that four Saratoga CERT members have volunteered to take the additional training curriculum to become credentialed Shelter Supervisors. If you missed the 25 February 2019 Shelter Fundamentals training class in the City of Saratoga Pisani training portable, it is still possible to attend two other training classes being conducted outside of Saratoga. These are: (a) Saturday, 06 April 2019, from 8:30 a.m. to 12:30 p.m. at the City of Los Altos Grant Park Community Center, classroom #1 (1575 Holt Avenue; Los Altos, CA 94024). (b) Saturday, 11 May 2019, from 8:30 a.m. to 12:30 p.m. at the Los Gatos Jewish Community Center (14855 Oka Road, Los Gatos, CA 95032).Please contact Chuck Rader at e-mail address charles_rader@hotmail.com if you desire to attend. He will forward the contact information for signing up for the classes. If seats are not filled and we get closer to the event, it will be opened up to NW groups, then possibly to NextDoor. We really need to fill all the seats. Someone asked if city will provide tourniquets, clotting gauze, etc. Michael Taylor would prefer participants to obtain those materials themselves. Details from Charles: Stop the Bleed classroom training: Two sessions to be held on Thursday, 25 April 2019 Currently, for the 5:30 p.m. training session: 12 seats of 20 total have been reserved. Eight seats remain to be filled. Currently, for the 7:10 p.m. training session: 5 seats of 20 total have been reserved. Fifteen seats remain to be filled.Please ensure all Saratoga CERT members are made aware of this excellent training. Chuck Rader will make any seats not reserved by 05 April available to (1) Saratoga Neighborhood Watch leads, and (2) to the general Saratoga community through the Nextdoor website. The City of Campbell Hamann Park CERT Division will be holding a six-hour long full-deployment field training exercise on Saturday, 01 June 2019, from 10:00 a.m. to 4:00 p.m. The rally point for the exercise will be in the southwest corner of the City of San Jose Marijane Hamann Park (just to the south of the tennis courts, off Almarida Drive). Street address for the park: 2747 Westfield Avenue; San Jose, CA 95128). 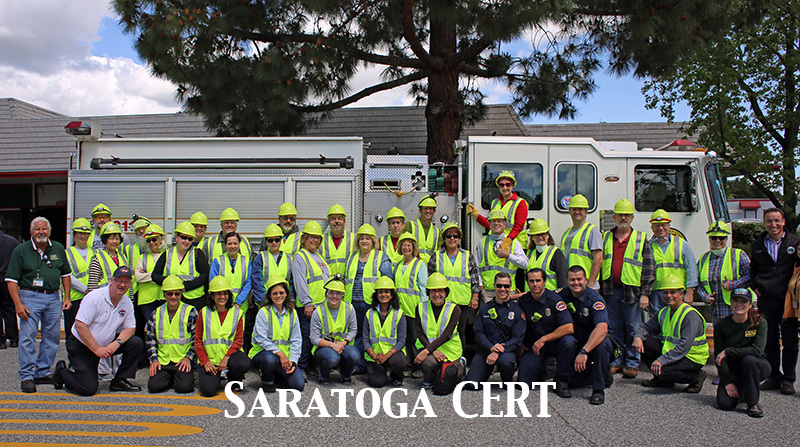 Saratoga CERT has been invited to participate in the exercise either as observers, integral members of the Hamann Park CERT field assessment teams, or as role players. This is an excellent opportunity to participate in an exercise conducted by a CERT organization with a long history of conducting comprehensive, well-planned exercises. Initial exercise planning calls for the establishment of a divisional CERT Incident Command Post, a CERT field medical treatment site, and the deployment of a large number of post-disaster neighborhood assessment teams. If you are interested in participating, please contact Chuck Rader at e-mail address charles_rader@hotmail.com. Jessica showed off maps that the GIS specialist within the city has provided. Jessica to ask if street numbers can be added to the parcels. Then will get printed and laminated. Jessica discussed that we still need two to four more folks to help man the table at the Blossom Festival on 4/13. Michael has an eventBrite link for registering to help. Looks like Jeff P. not able to assist in co-leading this Division. Davina interested in getting another to assist in the running of this division. They are also trying to bootstrap their NW program. Jeff will share with Michael the need for Saratoga CERT participation on various evenings and especially on the Graduation exercise. Saratoga CERT really needs to help make the graduation exercise a success. We’ll need one or two radio communication folks, and an additional 4 or 5 to pair up with firefighters at the various skills stations. We are all skilled and qualified to take on these roles, so, please step up and help out. Look for an Eventbrite to be created to register to assist. Heard more than once that we need to share more of our content via the saratogacert.org website. We need to publish all activities on the website calendar. If you need credentials to author documents, blogposts, or calendar entries, please contact Brent for access. If you have a need for more native FTP access, please contact Jeff. Michael Grodin from the City of Campbell CERT organization will be conducting “Stop the Bleed” training, with two back-to-back class sessions on Thursday evening, 25 April 2019. The training will be conducted in the Pisani Recreation Department training portable, located next to the City of Saratoga civic center Joan Pisani Center. The first session will run from 5:30 p.m. to 7:00 p.m. and the second session from 7:10 p.m. to 8:40 p.m. A total of sixteen (16) total seats will be made available for students in each session. The training, which is exactly the same in each of the two sessions, is focused on those immediate actions which should be carried out on someone undergoing excessive, life-threatening bleeding. After opening the Eventbrite page, select the start time for the session you wish to attend (5:30 p.m. or 7:10 p.m.) and then register. Help reduce wildfire risk and better prepare your family and your home with the Santa Clara County Ready, Set, Go program. Meetings are available throughout April and May. Action Item: Need a volunteer to call ALL active CERT members and cajole them to participate as we could use more help. Jessica? Action Item: Raji & Jessica will talk to Emma Burkhalter (City of Saratoga) for Quito/WV maps on Tuesday, February 26 at 10:00am. Action Item: Need an Incident Command post(s) and identify Incident Commander(s). Perhaps a separate post for either side of Hwy 85? Talk to WV college emergency preparedness/admin? Talk to Redwood Middle, for summer use? Marshall Lane Elementary? Churches? Action Item: Identify a divisional Ham operator who will part of the Incident Command post. Designate Peter Commandeur? Second ham operator? Who else in the Quito/WV area is Ham trained? Action Item: Peter, Jessica and Raji to plan a radio exercise to check out max radio range. March 4/5, at 4:00pm? Raji to connect w/ Jessica and Peter. Training will authorize CERT members to help out at shelter with general duties – cook food, distribute food/water, etc. CERT members (6-10?) can take an advanced curriculum class of 12-16 hours to become shelter manager. Do advanced class in mid-April? ARC can do a future field, scenario-driven exercise with mentors on how to manage a shelter. Saratoga City plan for a wild land Fire: Plan is being updated and formalized, and CERT could be mobilized in an emergency. Saratoga Disaster Council consisting of city mgr, mayor, asst emergency preparedness liaison, a senior rep from SCCFD, a senior rep from SCC Sheriff’s Office, will activate CERT. Red Cross advanced shelter management class will help with this. If we encounter stray pets in the neighborhood and they are approachable, use leash if animal has collar, establish a CERT kennel, log them in, do not photograph pet, can delegate oversight to non-CERT. This will include both classroom and some manipulative exercise. Please bring your CERT PPE to class. Thanks for your efforts and commitment to the community as a CERT member.